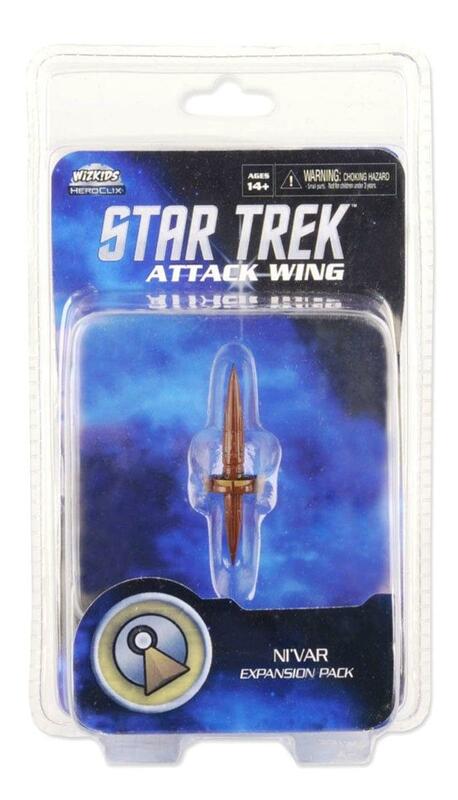 Expand and upgrade your Star Trek Attack Wing game! The Ni Var is a Suurok-class starship. The Suurok-class is a Vulcan science vessel and combat cruiser. It has a cylindrical hull with a circular nacelle that allows it to reach speeds of Warp 6.5 and greater. This is not a stand-alone game. A copy of Star Trek: Attack Wing Miniatures Game Starter Set is required to play. Expansion set includes: 1 Ni Var/Suurok Class Pre-painted Miniature, 5 Action Tokens, 3 Shield Tokens, 8 Captain ID Tokens, 2 Ship Cards, 1 Maneuver Card, 3 Captain Cards, 1 Admiral Card, 7 Upgrade Cards, 2 Mission Cards, and 2 Additional Rules Cards. The Ni Var is a Suurok-class starship. The Suurok-class is a Vulcan science vessel and combat cruiser. It has a cylindrical hull with a circular nacelle that allows it to reach speeds of Warp 6.5 and greater. Expansion set includes: 1 Ni Var/Suurok Class Pre-painted Miniature, 5 Action Tokens, 3 Shield Tokens, 8 Captain ID Tokens, 2 Ship Cards, 1 Maneuver Card, 3 Captain Cards, 1 Admiral Card, 7 Upgrade Cards, 2 Mission Cards, and 2 Additional Rules Cards.